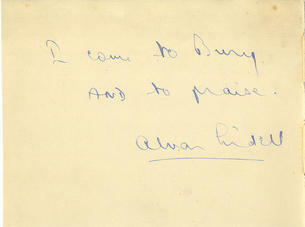 This is a Hand Signed vintage Autograph album page 5.25" x 4" by the late B.B.C. radio announcer and newsreader. He has humourously written " I come to Bury AND to praise "
Tord Alvar Quan Lidell (11 September 1908 - 7 January 1981) was a BBC radio announcer and newsreader. Lidell was born in Wimbledon Park, Surrey, to Swedish parents. His father John Adrian Lidell was a timber importer; his mother was Gertrud Lidell (nee Lundstrom). Lidell attended King's College School, Wimbledon and Exeter College, Oxford. As a boy, he studied piano, piccolo, cello and singing, and was a noted actor at Oxford. After some brief teaching and singing jobs, he joined BBC Birmingham as chief announcer, transferring to London after a year. He became deputy chief announcer in 1937, and the following year married Nancy Margaret Corfield, a lawyer's daughter (they had two daughters and a son). He made some historic broadcasts, including the announcement of Edward VIII's abdication. On 3 September 1939 he read the ultimatum to Germany from 10 Downing Street then, at 11 a.m. introduced Neville Chamberlain who told the nation that they were at war with Germany. It was during the Second World War that the BBC named its previously anonymous announcers and newsreaders - to distinguish them from enemy propagandists. - Here is the News, and this is Alvar Lidell reading it - became an inadvertent catchphrase. In 1943 he served with the RAF as an intelligence officer (some of the time at Bletchley Park), but returned to the BBC a year later. In 1946 he was appointed chief announcer on the new Third Programme, where he remained for six years, maintaining the highest standards, particularly over pronunciation and phrasing. In 1952 the BBC's news service was reorganised, and he returned as a newsreader, even doing a little television work. He was appointed an MBE in 1964 and retired in 1969. In 1979 he published an article about the deteriorating standards of speech at the BBC in The Listener - the BBC immediately set up a panel of experts to report on the matter. Lidell also worked as a narrator, and recorded over 237 volumes for Books for the Blind, including long works such as Anna Karenina. As a baritone, he gave recitals and recorded with Gerald Moore at the piano. Recordings of Lidell's news bulletins have been included in many films set in Britain during WW2, such as Battle of Britain.